We first wrote about these bees in May. These are a couple of mason bees that never emerged. We got them at the very end of the mail order season, and they'd probably been in storage too long. Unlike honeybees, mason bees don't have honey stores on which to overwinter. All they have is fat reserves in their body. If stored too long, they use up their reserves and can become too weak to chew their way out of their cocoon. The rest appear to have emerged successfully but dispersed, meaning they flew away instead of nesting in the Mason Bee Chalet. LESSON LEARNED: don't buy bees on close-out. This is a leafcutter bee at the end of a toothpick. I'm not sure what went wrong here. These are leafcutter bees that emerged prematurely (?). They are about 1/3 to 1/2 the size of a normal adult bee. (No, they're not alive.) According to the literature, the proper time for them to emerge is May, but if conditions are right, alfalfa leafcutters are able to produce a second generation of adults within one season. See the mother bee here. If she doesn't like it, the mother mason bee has to spend a lot of energy chewing out the paper liner. Most of the tubes remained lined or partially lined. LESSON LEARNED: leave some tubes unlined. My guess was that there would be 6 or seven cocoons per tube, so was very surprised to find 11 in one. That mother was very prolific! I suppose the more debris the better. It must mean the bees had a lot of food to eat before spinning their cocoons. The black specks are poop. You can see the eggs that failed to hatch, still attached to their provisions. These 3 larvae barely spun their cocoon. Timing probably affects the mother bee's success rate. If your place your cocoons out so that your bees emerge too soon before or, worse, after the main Spring trees bloom, she may not have readily available pollen with which to provision her young. Not counting the close-out bees, our harvest yielded more than double the 24 cocoons we started off with: 55 cocoons total, 39 females and 16 males. I put them all in one QuickLock tray for hibernation. In the normal order of things, one would not harvest cocoons. But just as a window in a hive is helpful for a new honeybee beekeeper, I think harvesting mason bee cocoons is an important thing to do. It helps you understand what is "normal" so in subsequent years you don't have to go digging around where you're not needed. In case you missed my tweet, here's what Crown Bees has to say about harvesting. 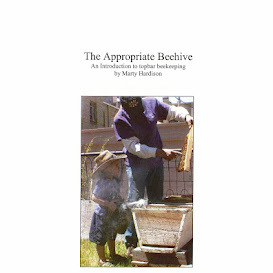 To keep some semblance of what would occur naturally, I kept the cocoons in the order in which they were laid with the mud chamber separator the mother bee provided each bee. And now, into the refrigerator they go, until March of 2013.